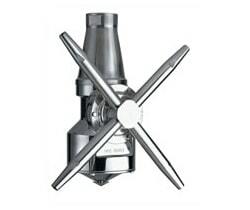 Designed for use in the brewery and beverage, dairy, personal care and biopharm industries, Rotary jet mixers effectively handles liquid mixing, gas dispersion, powder mixing, and tank cleaning while reducing mixing time, energy consumption and costs. The patented IM 10 Rotary Jet Mixer (RJM) does not only mix fast, efficient and uniform but creates also the necessary process flexibility that makes it easy to switch to new product formulations with diverse viscosities, densities and volumes. Besides classic liquid to liquid mixing the RJM is excellent for gas and powder dispersion plus a superb tank cleaning machine. The patented IM 15 Rotary Jet Mixer (RJM) does not only mix fast, efficient and uniform but creates also the necessary process flexibility that makes it easy to switch to new product formulations with diverse viscosities, densities and volumes. Besides classic liquid to liquid mixing the RJM is excellent for gas and powder dispersion plus a superb tank cleaning machine. The patented IM 20 Rotary Jet Mixer (RJM) does not only mix fast, efficient and uniform but creates also the necessary process flexibility that makes it easy to switch to new product formulations with diverse viscosities, densities and volumes. Besides classic liquid to liquid mixing the RJM is excellent for gas and powder dispersion plus a superb tank cleaning machine. The patented IM 25 Rotary Jet Mixer (RJM) does not only mix fast, efficient and uniform but creates also the necessary process flexibility that makes it easy to switch to new product formulations with diverse viscosities, densities and volumes. Besides classic liquid to liquid mixing the RJM is excellent for gas and powder dispersion plus a superb tank cleaning machine.